Thank you for taking the time to read this Travel Inspiration post. A2D Travel is designed especially for busy professionals like you. We simply do everything for you. From travel inspiration to providing a friendly, knowledgeable expert to make all the necessary arrangements. We understand what makes a modern holiday special. It's discovering the undiscovered. Sharing unique, jaw-dropping experiences with loved ones that you'll never forget and will talk about for years to come. So, let us tempt you with Peru & Bolivia. For more detailed information and to start planning your own adventure, please contact us now. It's been a bucket-list destination for years. And for good reason. The Andes mountains are home to Machu Picchu - the 15th-century Incan citadel that's one of the world's most iconic archeological sites and Peru's most popular tourist attraction. But there's so much more to see and do in Peru than simply visit Machu Picchu (although we highly recommend it). Love good food? Then head straight to Lima. Central and Maido are ranked #6 and #7 in the 2018 list of The World's 50 Best Restaurants. With Astrid y Gastón ranked #39, it makes Lima the number one place to sample the highest-ranking restaurant cooking on the planet. Food has been at the forefront of Peru’s cultural renaissance and it's arguably home to the Americas' most eclectic and exciting culinary scene. All eyes are on Peru right now. A swell of new galleries and designer shops have sprung up thanks to the success of Peru's global culinary scene. Contemporary art fairs include ArtLima and PArC and Mario Testino, the famed photographer and Peruvian national opened his museum MATE in 2012. 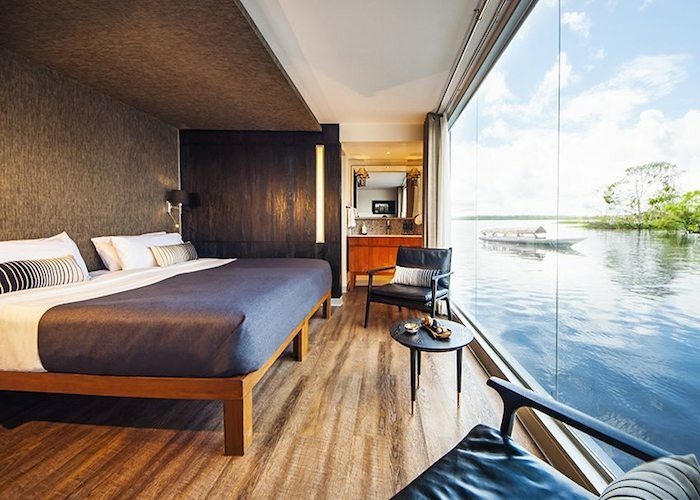 Enjoy a 5-star river safari aboard AriaAmazon, an ultra luxurious cruise ship that drills deep into the untrammelled heart of South America’s mightiest river. Weave through the Peruvian Andes on the Belmond Andean Explorer, South America's first luxury sleeper train. Diego Munoz (of Astrid y Gastón fame) created all of the exquisite menus too. Expect the unexpected on this 2,000-mile road trip around northern Peru that takes in some of the highest peaks and glaciers and off the beaten track jewels, such as the jungle Cloud Warrior Fortress of Kuelap and the breath-taking Gocta Falls. 4 hours south of Lima is Ica Valley's Ruta del Pisco - a government scheme highlighting the Pisco distilleries that open their doors to visitors. The fascinating region includes the Pacific seaside town of Paracas and the famous Nazca Lines. 1,500 miles of coastline and reliable offshore swell make Peru a favourite among the surfing community. Head to Huanchaco Bay, 350 miles northwest of Lima and learn to slice the through the waves on caballitos de totora, or " little reed horses” at the Muchik Surf School. Avoid the busloads of tourists. Climb mountain ravines and canyons to the Pre-Incan city of Chachapoyas with its remote cliff tombs and jungle-draped fortresses. Continue to the Andean town of Leymebamba to see its trove of mummies. Operated by the charity Crees, this 3-10 day rainforest tour includes bird watching, rafting, mountain biking and monitoring mammals from woolly monkeys to jaguars. All profits go to support the local community of Manú. Far Nrth, close to the Ecuador border, situated on a near-deserted stretch of Pocitas Beach, you'll find KiChic Hotel, a bohemian beachside retreat that ticks all the boxes. Vegetarian restaurant, yoga studio, seafood bar, tropical gardens & large double beds. It has it all. View humpback whales between July and October. Take a cycling tour to Eco Fundo La Caprichosa, a nature reserve, adventure playground with zip wires and quad bike-like UTVs, luxury hotel and organic restaurant. Breathtakingly beautiful. Utterly unique. A melting pot of cultural diversity. Bolivia is one of the coolest places in South America to visit right now. With its sky-high capital city of La Paz and lunar landscapes that look more like the surface of the moon, it's a one of a kind and totally unmissable destination for those looking for adventure. It's not just Peru where the restaurant scene has blown up; Bolivia is also experiencing an explosion of culinary greatness. When Claus Meyer, co-founder of Noma in Copenhagen, opened Gusto in La Paz five years' ago and a number of cookery schools across Bolivia and Colombia, he kick-started what is now one of the most exciting restaurant scenes in the world. Graduates of his schools have gone on to open their own phenomenal restaurants such as Ali Pacha, Propiedad Pública, Los Qñapés and Humo. Accompanying the slew of new Bolivian restaurants are a number of cool new places to drink. Gustu Bar at the same address as the restaurant is wildly popular and has an ethos of selling all-Bolivian homegrown spirits. Diesel Nacional (pictured) is another popular drinking spot. Old train tracks lead up to a rusting revolving door belonging to an old train wagon from the legendary Patiño Mines. Inside, all the furniture has been created from upcycled car parts, metal shafts and wheels. Candlelight and Bolivian craft beer add to its charms. Typica Cafe caters for the growing demand for Bolivia's award-winning coffee. Set in a small house in San Miguel and run by four friends, it's a quirky and fun place to visit. The salt flats of Uyuni, at 3,650m above sea level are an astonishing, lesser‑known wonder of the natural world. Nothing can prepare you for the exhilarating strangeness of this great white desert. And when it comes to unique experiences, they don't come much better than this. You can now stay in one of these futuristic looking pods at Kachi Lodge, the first luxury lodge of its kind on the Bolivian Altiplano. Stay in a remote, yet all-comfort-catered-for lodge in the forests of Boliva and work with the indigenious people of Chimane fishing for the Amazonian Golden Dorado. For those not quite ready to brave the salt flats of Uyuni, there are plenty of upmarket places to stay like the Atix Hotel, La Paz’s first boutique property located in upscale Calacoto. For those wanting to explore beyond Bolivia,Celebrity Cruises’ new yacht designed exclusively for the Galapagos Islands, Celebrity Flora, will sail with a glamping experience on the top deck that allows guests to dine, drink, and sleep under one of the most spectacular night skies in the world. Setting sail from May 2019, the 10 & 11 nights expedition starts in Quito, Ecuador. ARE YOU AS EXCITED BY PERU & BOLIVIA AS WE ARE? Interested in planning your own once-in-a-lifetime experience? Click the button below.